A train with a cinema car in four languages, uninterrupted Wi-Fi, live TV, and gourmet dining – No, it’s not science fiction, but the new NTV high speed train in Italy. Called Italo, the new Italian high speed train is a privately-owned train that has been designed with customer comfort, service and today’s technology in the forefront, and is simed at competing with the Frecciarossa high-speed trains of state-owned Trenitalia railway. Brainchild of Italian businessmen Luca Cordero di Montezemolo (chairman of Ferrari) and Diego Della Valle (of Tod’s Shoes) the new Italo train is billed as Europe’s most modern train. With 3 classes of service – Smart, Prima, and Club – and plenty of special offers, you can choose to travel for just 30 euros from Milan to Rome, travel in the cinema car and watch a free film, enjoy uninterrupted mobile phone service and Wi-Fi internet, or be served a meal at your seat in Prima or Club class. Business travelers can book a private 4-seat lounge in the Club car with the daily newspaper, espresso and breakfast, or choose the Relax car where cell phones must be turned off. Food service is being handled by Eataly with 3 different menus focusing on quality Italian ingredients, plus on-board vending machines offer espresso, cold drinks and snacks. Italo train service starts April 28, 2012, along the Milan-Bologna–Florence-Rome line, with more routes being added through the year that will serve Venice, Turin, Padua, Naples, and Salerno. Tickets can be booked online and special offers can be found on the Italo website, where you can search for the dates with the best available fares and timetables. Or give the Italo phone center a call at this easy to remember phone number: 06 07 08. Tickets may also be purchased at the dedicated Casa Italo booth, located in all stations served by the NTV Italo train service. The sleek Italo train is painted Ferrari red, and travels at speeds of up to 300 km per hour. If you were hoping for a fast modern train system in the rest of southern Italy, you’ll have to wait years for new train tracks to be put in place, a probability that at the moment seems roughly equivalent to winning the lottery. 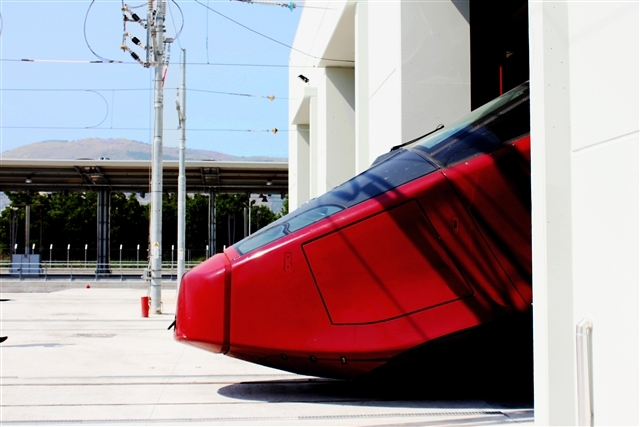 In Sicily, where train travel is noteworthy for being slow and dusty, the high-speed Italo train remains a sci-fi concept. I want to take a trip with this train soon! Do they have senior rates for people over 70? Check their website for their fares, which can change. And even without a senior rate there are great deals to be had. HELP! THE ITALO WEBSITE WON’T LET ME FINISH BOOKING MY TRAIN TRIP TO VENICE. IT SAYS I MUST PHONE 06.07.08–BUT I’M IN AMERICA SO I NEED A NUMBER TO CALL ON FROM USA–I NEED TO BOOK AS SOON AS POSSIBLE AS TIX ARE SELLING FAST! Try dialing the access code and country code first: 011-39, then the number. Good luck!